Canonic imitation [See blog, Canon, Parts I, II, III] is based upon the idea of a follower and a leader (photo) and can be the basis for an entire composition. Theoretically, the imitations can be at any interval, but the octave is the most common, at a distance of a half bar, whole bar, or 2 bars. Technically, all you need to have a canon is 2 identically moving, independent melodic lines a certain interval apart where one line chases the other in imitation from a certain distance; this "chasing" can be at different speeds and even be going on in inverted form while the same theme is sounding with it right side up. The Pastorale in Ab Major Op. 12 is an example of this; this is a work with 2 themes which are treated profusely with a variety of canons [See blog, Getting Started With Writing, Part VII]. When there are 3 lines in this "race" all moving in canonic imitation, we have a 3 voice canon; when there are 4 lines we have a double canon; when there are 6 lines we have a triple canon; when there are 8 lines we have a quadruple canon; theoretically, there can be any number of "runners," or moving lines, in this race. At the same time, the thematic material in a canon should be tuneful and memorable, even singable, if possible, to where it can overlap in an interesting way with itself without sounding like a mechanical exercise delivered to the listener with one sound and one rhythm, from start to finish. You don't have to tackle a 3 voice canon on your first attempt, even though it presents little difficulty beyond a 2 part canon; but actually, it's not that hard at all. An example of a piece which has 4 different 3 voice canons at the octave is Canon in Bb Major Op. 16 (photo). In this score the thematic material, which occupies 14 bars, is presented in 3 voice imitation throughout the entire work, one part assigned to the right hand, one to the left hand, and one to the Pedal. Structurally therefore it represents a trio in 4 separate sections, the first of which presents the thematic material in imitation in the tonic key (Bb) first in the right hand, then the left hand, then the Pedal, at a distance of one bar each time; this creates a leader and 2 followers which are staggered the same distance apart and trailing behind, doing the exact same thing as the leader. 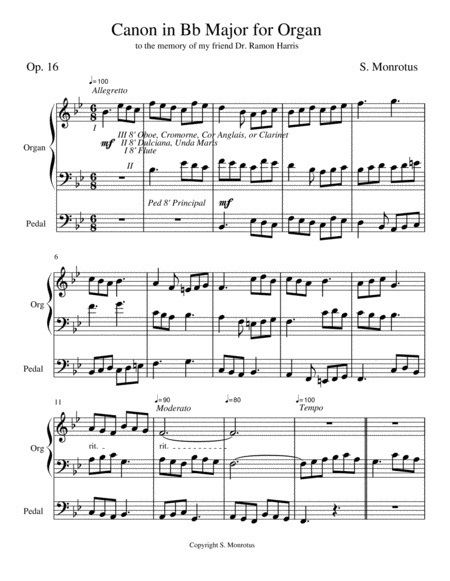 The 2 parts which follow the leader here are an exact imitation or copy, note for note, and modulate after only 4 bars to the dominant key (F); note that the opening line in the score begins a bit more slowly, then is brought up to Tempo when the 2nd line enters; this Tempo is then nuanced throughout the work each time a new canon begins; a different registration for each canon is also suggested in the score. For the 4th and final canon there is a marked reduction in volume and tempo; the music ends ends very slowly and quietly here on a Celeste stop with the employment of a decrescendo. A connecting phrase then takes the music into the relative key (g minor) where the 3 voice canon is repeated beginning this time with the left hand, then the right hand, then the Pedal. In this 2nd 3 voice canon the left hand line is tweaked by transposing it an octave higher to allow room for it to move without bumping into the other 2 moving lines [See blog, Tweaking]. The 3 voice canon commences again in the 3rd section, this time in the subdominant key (Eb) where all 3 parts proceed in inverse movement and enter first in the right hand, next in the left hand, and finally in the Pedal. The music remains in the subdominant key (Eb) for the 4th and final section where the 3 voice canon enters right side up again, first in the Pedal, second in the left hand, and third in the right hand. In this 4th 3 voice canon, here again, the left hand line had to be tweaked by transposing it an octave higher to get it out of the way of the other 2 moving lines. All 3 moving lines then come to rest on the tonic chord. You'll find, in writing 3 voice canons at the octave like this, that the moving parts at times create momentary dissonances as they overlap each other. If a dissonance like this isn't too offensive and resolves quickly you can treat it as a passing tone and leave it, as is, but you should should not be surprised by this; it happens to everyone who writes in canonic imitation, even the great masters, as they worked their way through their compositions. As their pens moved along they discovered parts that "bumped" into each other harmonically, requiring something to be tweaked to get it to work with the other moving lines. In situations like this, you'll want to change a note or two, either with a chromatic inflection or by placing the offending note on an adjacent line or space, to get that part to "fit" tonally with the other 2 parts in the harmony. This is especially true if the canon modulates to a neighboring key; the 7th degree of the scale of the new key, everywhere it appears, will have to be sharpened a half step in order to have correct harmony; other notes may also require chromatic inflections to reflect note positions within the new key. After you make a correction like this, you'll want to go back and correct those same spots in all previous entries for the sake of consistency in order not to dilute the formal rigor of the thematic material everywhere it appears. Again, don't be surprised if you have to do this repeatedly in your work until it looks right on the page and sounds right; your ear will be the judge, but it might take several "tweaks" like this to get it where you like it. It will be worth the effort, because the result will give the impression that it all came together by accident from the pen of a genius. But it isn't genius; it's just craftsmanship. And craftsmanship can be learned. As the parts overlap in canonic imitation, observe the movement happening in the lines closely; it should proceed wherever possible with regularity and constancy without any held notes ever getting "stalled out" all at the same time, waiting for the next beat. It's best to go back and change the rhythm of one or more parts in order to create movement wherever possible in at least one part as they all line up vertically; held notes in one part generally demand faster notes in another part going at the same moment of time. Writing a piece like this is something like working a crossword puzzle; at times, indeed, you're puzzled; some skullduggery might be required; you might get started and after a couple of bars find that you're at a dead end and have to back up and take a different route; and, there are those joyful times when you're happy that something seemed to "fit" in vertical harmony automatically. One thing about it: you're never bored. Here's a tip: in the thinking through of the harmony desired with your canonic note writing, it helps to outline the tonic chord in the first bar (or maybe half bar) and the dominant chord in the 2nd bar (or maybe half bar), then keep alternating between these two regularly as the canon proceeds. This way, as the "follower" moving parts set out to chase the "leader" and all the parts begin to line up vertically, it's more likely that they'll form consonant intervals with each other and make good harmony with fewer collisions. J.S. Bach employed some of this same thinking when he wrote his famous organ Toccata in F Major; this work opens in a most unusual way for a toccata ... a strict 2 part canon at the octave over a tonic pedal point (held pedal note) ... a canon which is repeated note for note in the dominant key (C) with the parts switched to opposite hands following a long, drawn out Pedal solo. As you get the "feel" for canonic writing, you'll find that your ability for composing will begin to take off and proceed more rapidly than you ever suspected. And, it will be fun.